So excited to be able to make a card and share today. I have not been able to craft for almost a month because I was away in India. I lost my father to Interstitial Lung Disease. It took a while for me to get back to normal routine. So sitting down this morning to watercolour and make a card has been very relaxing and therapeutic. 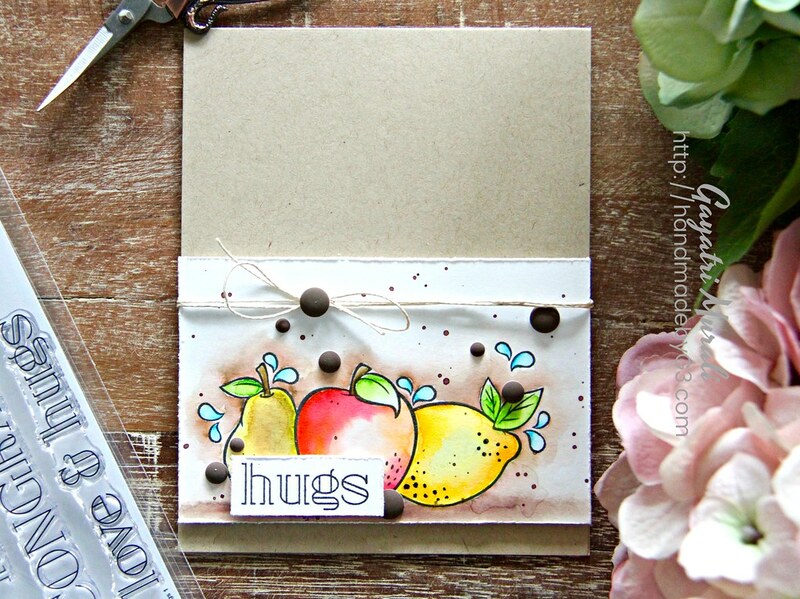 This is a quick post to share a watercolour card using Simon Says Stamp Dancing Fruits and Big Greetings 1 stamp sets from Simon Says Stamp One of a Kind release. I used masking technique to stamp, mask and stamp the images into a cluster using Simon Says Stamp Intense Black ink and mini MISTI. Then I used Zig clean colour brush pens to colour my images and background. I used Bristol paper here. I then used one of the brown colours to spatter on the panel. I trimmed the panel, roughed the edges and adhered on a kraft card base using foam adhesives. I also wrapped natural twine into a bow on the panel. Then used matt brown enamel dots to embellish. The sentiment is from Big Greetings 1 stamp set which I simply stamp on a strip of the Bristol paper I cut from the main panel, roughed the edges and adhered using foam adhesive. Here is a closeup. 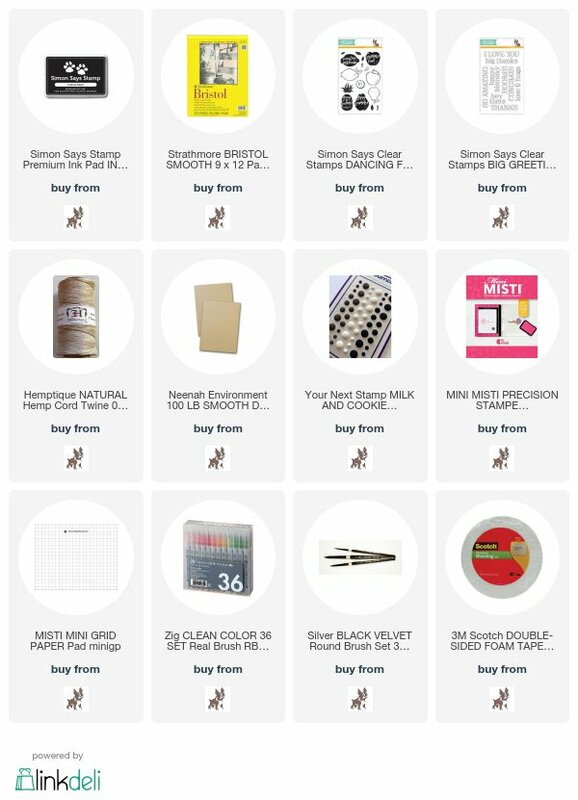 Here is a long pin for you to add to your Pinterest Board. A beautiful card Gayatri. And deepest sympathy on the loss of your father. Such a loss for you and the family. 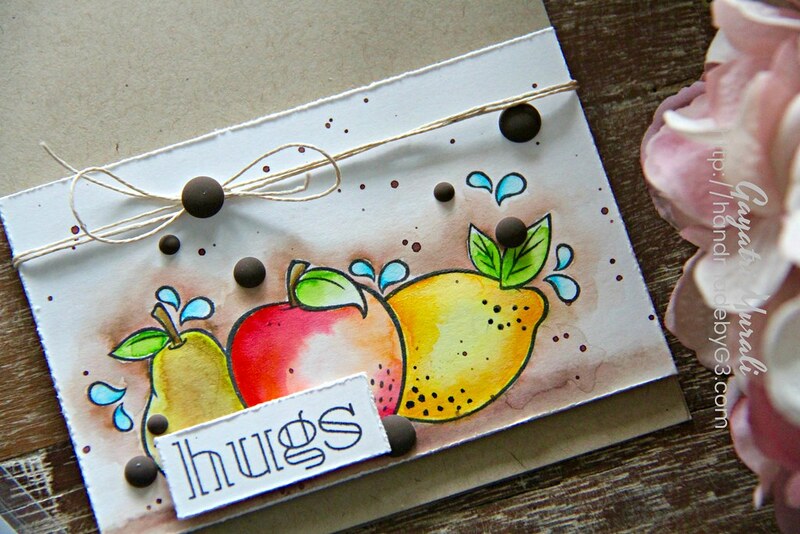 What a beautiful card Gayatri, I love the watercolored fruit and the roughed edges on your panel. I just bought this Dancing Fruits set from Simon and I’m really excited to play around with it. Thank you for the inspiration. I’m so very sorry to hear that you’ve lost your father, my heart goes out to you. I’m sorry about your dad. May he rest in peace and may you find healing comfort in the Lord’s embrace and love.